Were you part of the Piedmont family? Or at McKinney Silver & Rockett way back when? Please leave a message or comment at the bottom of this post. Or email me directly. In 1984, Piedmont Airlines was named Air Transport World’s Airline of the Year. Tagged “The Up And Coming Airline,” Piedmont tapped into the civic pride of the mid-Atlantic and South as the little airline that could. For several years, it was the only profitable large airline, as competitors such as Delta, United, American and US Air lost huge amounts. 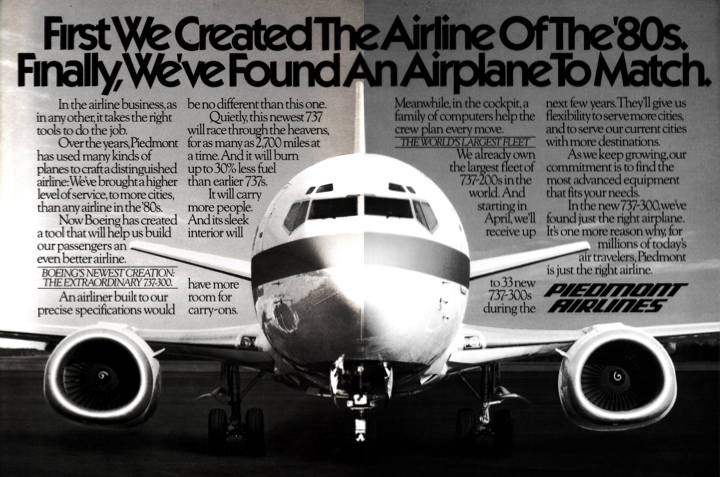 Piedmont was quite literally the airline of the 80s. 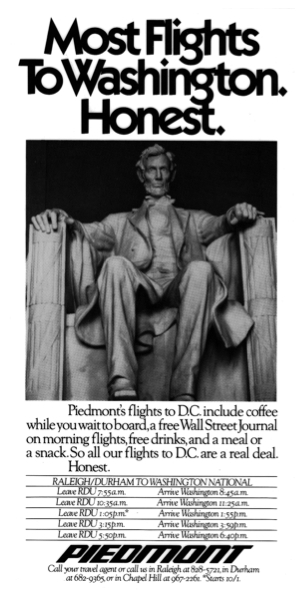 Sadly it was folded into the less profitable US Air in 1989. It was a great account for a young copywriter. I was forced to crank out copious amounts of work: small-space print ads, the occasional larger ad, and radio commercials on a weekly basis. Most of it was strictly tactical: announcing new flights that usually involved small Piedmont markets to larger destinations. 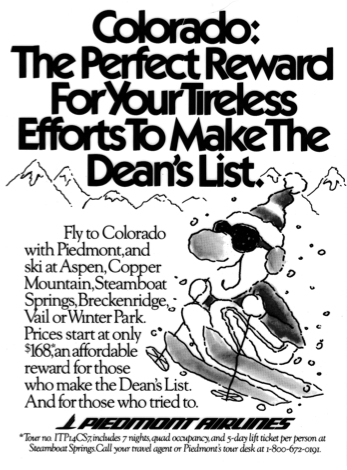 Steve Basset once even talked me into writing the Piedmont flight schedule… that’s the cruel sense of humor that today produces ads for Geico and WalMart. It was a great lesson in how a large account should be run. Chick McKinney had assembled a wonderful and deep creative staff, including some of the best print art directors in the business. My partner on most of the work on this page was Danielle Renfer; the creative director was Michael Winslow. It was also a great lesson in the value of small-market agencies. The home-grown staff at McKinney Silver & Rockett of Raliegh, North Carolina, helped Piedmont outrun its bigger rivals with their big city ad agencies. For years, McKinney’s work for Piedmont was easily the industry’s best. I worked for Piedmont Airlines and USAir between the years 1984 – 1992. Long before I went to work for them, they attracted my personal business as a passenger with their Friendliness, Professionalism, Route network as well as their Advertising! Thanks for some additional insight into their advertising! Steve, I’m so happy you found my site! Thanks for your comment. I’m trying to find the old radio commercials. They were pretty good if I recall, though nothing groundbreaking. Harriet Frye was a great, great writer who conceived the radio campaign. It involved some wonderful music and a great voice talent from New York. We would write scripts and the voice talent (I know I’m getting this wrong, but his name is close to Allen Blevis) would record the voiceover in a New York studio, while I would direct via the telephone. It was a great system for cranking out dozens of spots a month. Each spot ran locally wherever there was a change in the service schedule. I hope to get some of the commercials, if my old friends at McKinney still have anything on file. I’ll post them if I find anything. I wish you luck on finding copies of your Piedmont spots in usable form. I still have about a zillion old open-reel audiotapes, including a bunch of the Piedmont stuff as well as my own personal favorite, the Pine State campaign featuring the late great Bob Dryden. The only trouble is, they’ve deteriorated to the point where they’re mostly just tape squeal. I think there’s some sort of expensive process that can be used to restore them long enough to duplicate them, but “expensive” is unfortunately the key word here. Amazing what, and who, turns up when you get bored on Thanksgiving night and start surfing the net! IS a great writer! IS a great writer! How wonderful to hear from you. I wonder what Mabon Childs, the last person at McKinney I still know, can do for us? I was actually looking for Mabon Childs and found you! Barrett, it’s so nice to know you are around and doing well. McKinney was a unique place, never to be repeated. daj mi se javi da znam da sam dobro spojila Chapel Hill, Damjanovski, art i Gina Morehead!!!! Ja zivim u Montrealu vec 15 godina. SO THERE YOU ALL ARE!!! I decided to spell my name with one “s” and look who I have found……the group from McKinney, Silver And Rockett. It was a great Agency and I spoke recently with Mabon. I speak regularly with Charlie Ashby about the “Heels” and my loyalty there goes back to all of you and Piedmont and Charlie Ashby. 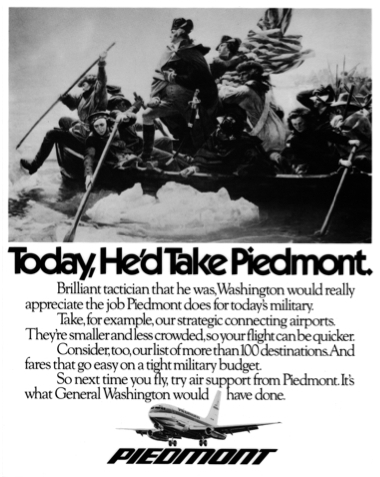 It was great advertising created for Piedmont and I agree that Southwest’s ads are memorable for the same reason. The correct spelling of my name is Alan Bleviss, but legally there are two “l” in my first name, but I always wanted a “stage name” so I dropped one. Nice to see you are all still around, even if spread around. So, let me say thanks for including me in Piedmont’s history… it was an honor. I heard your voice on an Enterprise commercial. I remeber it from when I worked at Clare Burt Studios in Toronto in 1975. Some voices you don’t forget. Alan, I don’t have any of the old Piedmont radio spots. I probably wouldn’t even remember which ones I wrote and which ones belonged to Mabon, Harriet, Steve or Charlie. But if you have a digital version of any of them, please let me know. I’d love to post one or two. Thanks for the kind post. Please tell Ashby to get in touch before the Heels get eliminated. He better hurry! Barrett–boy, do those Cavaliers know their basketball. It was great to see your work and how well you’ve done. Take care. Come visit if you get back east. Oh, my gosh! Alan Bleviss himself! Sorry about the spelling, Alan; I guess I never knew that because I wasn’t the one who wrote the checks to you. I’ve talked to Mabon and Barrett recently but haven’t been in touch with Charlie Ashby in years. Do tell him I said hey, would you? All I know is to hell with all this airline stuff. I MISS ALL OF YOU. A LOT! Oh my gosh. Suddenly its 2 AM and I’m back in the studio at McKinney kerning type with my trusty exacto……. I still have two of those lead drawing table base & drawing boards abd they are still square & level. Bring on the spray mount. And wearing all those little spray-mounted bowties home, no doubt. Do you, Sir, have any information on a small airfield (if it was even that) in Williamsburg, VA during 1947-1949? A Ralph A. Midgett, Jr. came from there to then work at Piedmont as a mechanic, as best we can tell from records. But, he also had small props planes that he possibly flew from Williamsburg to Norfolk for business people. Thank you for your time, if this is of any interest to you. MP, I do not have this information, but maybe someone reading this will — and will pass it along. In the meantime, I’ll ask some folks who may know. Thanks for posting! So wonderful reliving those memories. Best agency and best client EVER to work for in my career. Miss you all personally and professionally. Hi Barrett, I’ve been googling folks from the old days at McKinney and The Martin Agency. Glad to find you, and hope things are going swimmingly. McKinney was the best! Brian! Great to hear from you. Yes. McKinney was a special place and time. I’m still in touch with a few folks — Charlie, Michael, Steve, Bill K.
As you may have figured out, seven months later, this website project has kind of fallen by the wayside. Very best wishes to you. .
Not sure if anyone will see this since this particular conversation seems to be years old. But I will give it a shot. For what it is worth, your work was amazing. 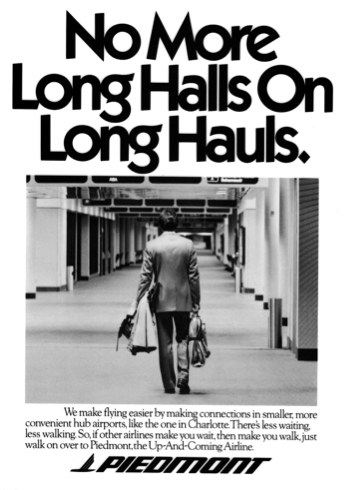 We have so many of the old ads and huge books of the originals donated by your agency when the airline ceased to exist and was absorbed by USAir. Thanks for your incredible work and all my best, Chris. Thanks so much for the kind words. I’m sorry to hear of Alan’s passing. What a nice man, and such a pleasure to work with. Best wishes to you, Chris.